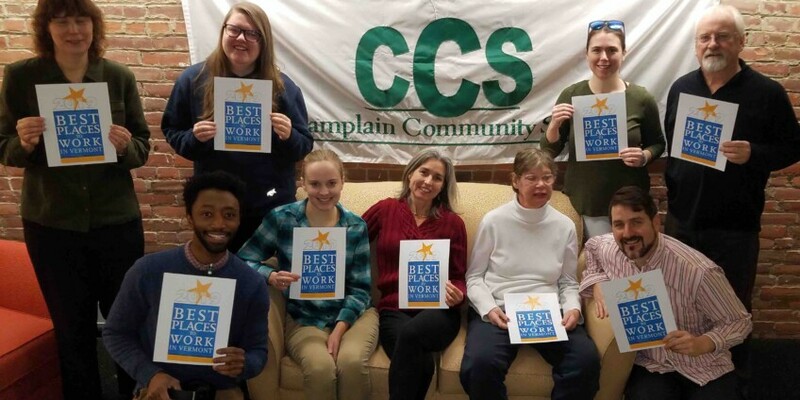 Champlain Community Services (CCS), a nonprofit organization – and VBSR member — supporting people with intellectual disabilities and autism, recently earned recognition as one of the Best Places to Work in Vermont for 2019. This statewide survey and awards program is designed to identify, recognize and honor the best places of employment in Vermont, benefiting the state’s economy, its workforce and businesses. CCS is a Specialized Services Agency (SSA) within the State of Vermont’s Developmental Services system. Its supported employment program, Way2Work, is nationally recognized and provides a unique continuum of employment training and career development supports from high school to retirement age. Businesses from across Vermont entered the two-part survey process to determine the Best Places to Work in Vermont. Each nominated company’s workplace policies, practices, philosophy, systems ,and demographics, were evaluated, along with an employee survey that measured the employee experience. The combined scores determined the top companies and the final rankings. Best Companies Group managed the registration and survey process, and also analyzed the data to determine the final rankings. Sightler said that, as a steward of public money, it’s important for CCS to demonstrate that CCS be able to demonstrate that we’re doing everything possible to care for our staff, reduce turnover and support staff development. More information on Champlain Community Services is available at www.ccs-ct.org.